Who is Fly Fish Pennsylvania? New in 2005 - Floats For Four, Say No More! 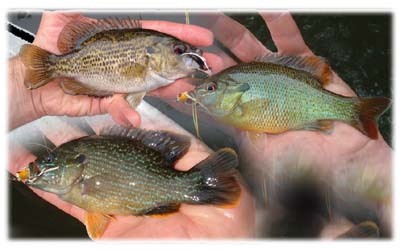 Fly Fish PA now can accommodate four person float trips. With the off-season acquisition of a 2005 ClackaCraft 15LP - we are your answer for corporate outings, reunions, get-togethers or just a good 'ole fashion day of hangin' out with your buds! Leave the golf course behind and hit the water! Contact us if you have any questions. Finally!!! We are getting some much needed rain. Even though it came in sudden bursts. Earlier this week we had a good group of guys from FL, OH and AL. It would have been a Lehigh trip, but with the low flows and high temps, we opted for a nearby water. All was good to us! Just enough bugs and lots of fish. Enjoy the holiday. It is time to get outta Dodge, aka.....Philly!!!!! Awesome looking PA summertime brownie. Please take the time to submit your comments AGAIN to the PFBC regarding the Simplification Proposal. They have extended the comment period due to some changes to the Fisheries Committee proposal. Under the new proposal - harvest size would be 18" on Trophy Trout waters. We need to protect these big fish. Tell them you oppose the TT Regs and endorse the C&R Regs. It's that simple. Send your comments here. 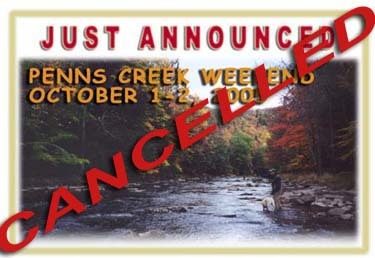 *No harvest - Labor Day to following opening day of trout season. *Opening day to Labor Day - harvest 1 trout 18" or larger (the *24" minimum proposed at an earlier meeting was abandoned as being unrealistic). *Barbed hooks may be used. *Same as TTALO except that bait may be used. *Applies to 5 stream sections only. *Consider putting into effect unless landowner requests otherwise. With the cooler water and air temps, but lack of flow for floating, we decided to recon a few areas below Francis E Walter. Water temp was 66-67 in late afternoon and the bugs were hatching big time. Lots of isos, sulphurs, olives, little green and yellow sallies as well as a few mayfly spinners thrown in for good measure. And each rock contained lots of nymphs - and great numbers of BIG stoneflies. We picked up a mix of browns, bows and brookies. Hot flies were olive cdc sparkle dun, sulphur sparkle dun and iso sparkle dun. 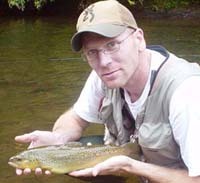 A nicely colored Lehigh River brown. Last year at this time we were cancelling trips due to too much water. This year we are cancelling trips because of a lack of water and high water temps. Oh well...what can ya do. The bigger trout waters are at the stressed level. But with this little repreave in the heat - water temps will back down some, but the underlying theme is - we need some rain. Just think if we did not have those three years of wet weather. Our waters would be flatlined A LOT lower than they are now. Tully - As for a report...we did manage to seek in a trip with JoAnne and her son Brad on the Tully earlier this week. 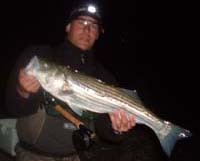 There was a lot of streamside instruction since we did not want to get in the water till the low-light hours. Overall the fishing was alright. Each managed to pick up a fish, and there were plenty of fish flashing down deep. The key was to get the fly deep. The fish were not showing at all, and so some lead was needed to get the fly down. Once again the nitro did the trick. We hope to start hitting the 'Hanna soon!!!! 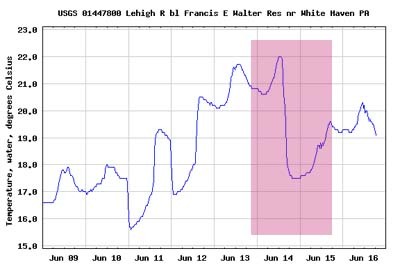 This week has seen a historic moment for the Lehigh River below Francis E Walter. Never in its 44 year history has this reservoir ever had a true coldwater release until Tuesday. Take a look at the chart above. On Tuesday water from the bottom of the lake was mixed with water from an upper level. This drastically brought the water temps down. The thing is there is not much coldwater to work with....and the Army Corps does not want to exhaust all of it at once, so they are tyring to maximize it via a mixing plan. Pretty neat stuff! This Wednesday is the deadline to submit comments to the PFBC about the 'Simplification Process for Trout Regulations.' Please send in your comments, if you have not done so already, stating a preference for the C&R alternative. 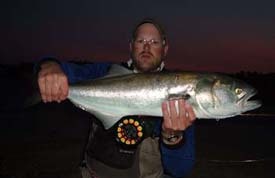 This focus is the best management practice for our top trout waters. To read more about this proposal - click here. Comments can be emailed to the PFBC @ ra-pfbcregs@state.pa.us. Thank you! Click on the photo above to read more about the Po. This is a great little tailwater. Good bug life and lots of fish. Check it out. Due to high water temps we decided to reschedule the trips we had lined up over the weekend. By the end of the week air and water temps should come back to more trout tolerable levels. Most important right now is some much needed rain, and cooler overnight temps. This is vital for a trout stream. Temps on all but the absolute coldest trout waters - like Big Spring and the Po - are borderline too warm for fishing. 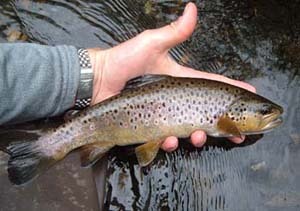 Be responsible and hit the headwater brookie waters or try the warmwater action. Hit the river the other night for an extended evening float with Mike. He and his wife fished with us the other week. 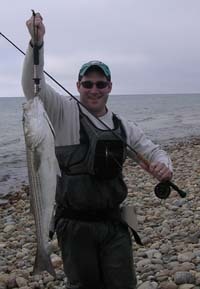 Mike was out fished by his wife Pam and wanted to redeem himself. After last night I think he did. Mike landed only two fish but stuck at least a half dozen more which spit the hook - a couple of which were in the 15" range. Of the two fish landed, one fish was a 6" brook trout and the other a nice 13" 'bow that was in great condition. Questions are now being raised as to whether the PFBC or some other group slipped some fingerlings in the river. It is highly unlikely though since this brookie was gorgeous, all fins intact and extremely fat. Bugs observed hatching were BWOs, sulphurs, big stones and a few caddis. No pics tonight. Wanted to limit stress on the fish. Water temps were in the low 70s. Not ideal for trout fishing but the fish were active. Release from Francis E Walter was 250 cfs and 63-64 degree F. This is not cold enough and more storage is needed to sustain this fishery for over 50 miles from the dam. I will say this - water temps could have been much higher if the release was in the high 60s as it normally is this time of year. So with the 90+ heat we have been experiencing lately, we really are seeing a slight improvement on a small scale as a result of the Corps storing more water in the reservoir. Water temps could have been a lot worse if not lethal to the fish last night in that heat. We are back in PA and another year of MV is in the books. 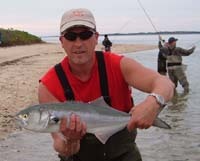 This year will be remembered for the big fish our group tangled with and all the bluefish you could ever want!!!! 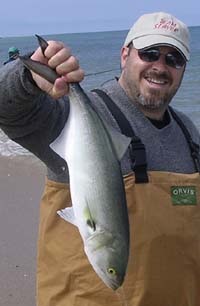 Everyday brought an onslaught of bluefish devouring anything you threw at them. At times we had five people hooked-up on the fly at one time. A super-fast strip did the trick, as it did not matter what kind of fly you used. Then once the blues would begin to thin out - which was usually toward the end of the evening - the bass moved in. And some were big! 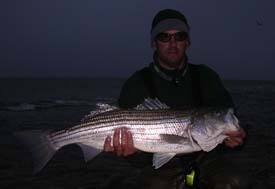 We got numerous fish in the mid-20" range and a bunch over 30". The highlight was a 42" pig - picked up on a white streamer. It was let go to fight another day. Most effective fly of the nighttime hours was our Pusher Fly! Either white or black. Check it out. 42" fly rod bass! Truely a trophy fish!!! 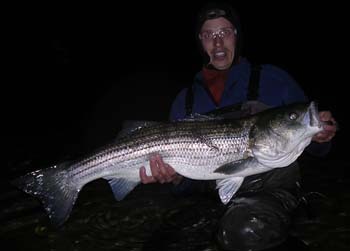 This bass was picked up amongst the wolfpack blues that are all around the island. Just think what this fish will weigh come the fall blitz!! According to the islanders the fishing has been the best they have seen in years - for this time of year. Of course though, the action for the Martha's Vineyard Rod and Gun Club Catch and Release Tourney was less then stellar - and did not reach expectations. Lobsterville was dead as was Dogfish...but if you looked around - you found the fish. In fact I can't remember when Lobsterville has been on for this event. Nonetheless MV never disappoints. We are back on the Lehigh this week. Low water continues to plague our streams. It is hard to believe we need rain to replenish our watersheds after the three wet years we've had, but we need it big time! Now is the time to think twice about hitting your local trout water, as the fish might need a break if this heat and lack of rain continues. Look for reports as the week progresses.